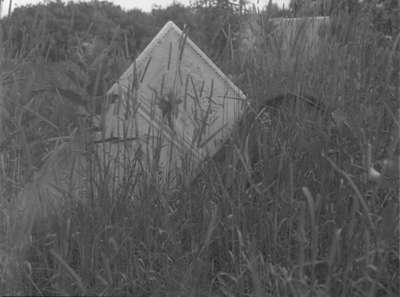 A gravestone (headstone) at Wesleyan Methodist Cemetery in Oshawa with a bicycle tire laying against one side of the headstone. Wesleyan Methodist Cemetery, 1948, Marjorie Ruddy. Whitby Archives A2013_040_1134.